How to choose an electric fan heater for the best heating. It is spring now, but winter will come anyway. In this regard, the question of “How to raise the temperature in the house when it is cold weather?” is still actual. There are many different alternative methods and heating systems at present time. Let’s consider, perhaps the easiest way to warm the room and talk about how to buy an electric portable fan heater. An electric household fan heater (blow heater) is a device designed to heat the living space by heating the air through contact with a special element and the spread of heated air with the help of a special fan. 1. Type of heating element. A metal spiral is used as a heating element in a spiral fans. This spiral is heated to a high temperature when the electric current passing through it and gives its heat to the flow of air. 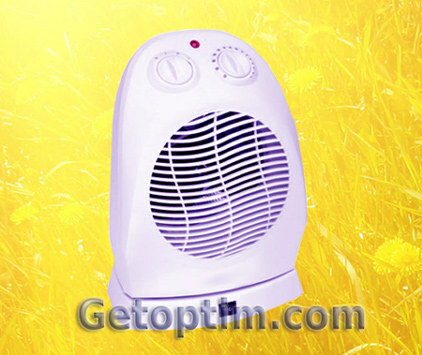 The main advantage of these devices is their price – the cost of cheap heaters is about $15. However, the significant drawback of such heating devices is that a heavily coiled spiral significantly reduces the amount of oxygen and “dries” the air. Also, as a result of dust falling on a spiral, an unpleasant smell may appear. Spiral fan heater can be bought if you need to use it from time to time and do not want to buy a more expensive model. A fan with a closed heating element quickly heats the air, but there is no a direct contact with the heated element. Due to this oxygen is not “burned”. A ceramic plate is installed in a ceramic fan heater. This fan has a relatively small “working” temperature (an average of 100 degrees), which provides almost complete absence of influence on the air quality in the room. If you plan to use a room fan heater as a main heating device – it is better to buy a ceramic heater or a model with a closed element. The power of a fan heater is mainly determined by the possibility of a heating element – the greater power provides the stronger heated of this element and it can heat more space. Wattage of compact fan heaters is often in the range of 800 Watts to 3 kW. There is such an approximate calculation of a heat fan power for the heating of a particular room – 100 Watts per 1 sq. M.
That is, for example, a Delonghi HTF-3020W fan has 2000 Watts power and it is designed to heat a room up to 20 square meters. Based on this ratio, you can easily calculate the power of a blow heater you need. Most fans have the ability to adjust the power from the minimum to the maximum value – this help to adjust a temperature of heating. A temperature controlled fan is the best choice. Presence of an adjustable thermostat. About a heating thermostat we have already mentioned in the article about electric convectors here. Timer. You can adjust a device working time with a timer. Display. A display may show you an air temperature and other data related to the operation of a device. Remote control console. This device helps to control a fan remotely. Cut-off autoswitch. This is a very important point that helps to increase fire safety. Do not forget that a fan heater can work as a simple fan and it can be used in the summer to cool air. We would like to say a couple of words about the next question: what is the better device to buy – a convector or a portable fan heater? Each of these devices has its advantages and disadvantages, but personally our opinion that a convector is still more effective. In addition, the work of a fan is always accompanied by more or less, but annoying noise, while the convectors are silent. Hopefully, it will be easier for you to choose a fan heater now.